Hi, Good morning. Thank you, friends and viewers. 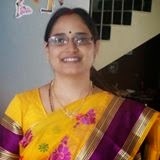 Today I will post how to make Dry Fruit Laddu recipe. Dry fruit laddu is a very healthy sweet even small kids can make it. Kids find it funny also. This recipe needs very less ghee and also needs no sugar at all. If all the ingredients available with us we can make it in a jiffy. Here I am posting it with step by step instructions along with the necesary pictures. And also giving a simple video reference. To play the video click on it. Please do write your valuable comments beneath the post and also subscribe to my channel for more videos. Chop all the nuts. Cashew nuts, Almonds and Pistachios. Chop dates and figs. Grind them or even we can cut them into small pieces. Dry roast poppy seeds. Keep them aside. Heat ghee in a pan, add edible gum to it. Fry it till it become bubbly or till it starts spluttering. Keep them aside. Again heat ghee and add all the chopped nuts to it. Fry it for 2 minutes or till the aroma comes out. Now add dates and figs mixture to it. Add poppy seeds and cardamom powder also to it. Mix well. Take this entire mixture into a wide plate. Make powder of edible gum and add that also to the above mixture. Mix it well and allow this to cool to handle. Take a lemon sized portion of the mixture and make laddu. Repeat the same with entire mixture. Dry Fruit Laddu -- sweet made with all the dry fruits and dates. Heat ghee in a pan, add edible gum to it. Fry till it become foamy or till spluttering starts. Keep them aside. Again heat ghee and add all the chopped nuts to it. Fry it for 2 minutes or till the rawness goes off. Now add dates and figs mixture to it. Add poppy seeds and cardamom powder also to it. Mix well. Take this entire mixture into a wide plate. Make powder of edible gum and add that also to the above mixture. Mix it well and allow this to cool to handle. Take a lemon sized ball of the above mixture and make it into a laddu. Repeat the same with the rest of the mixture. Make laddus of your desired size. 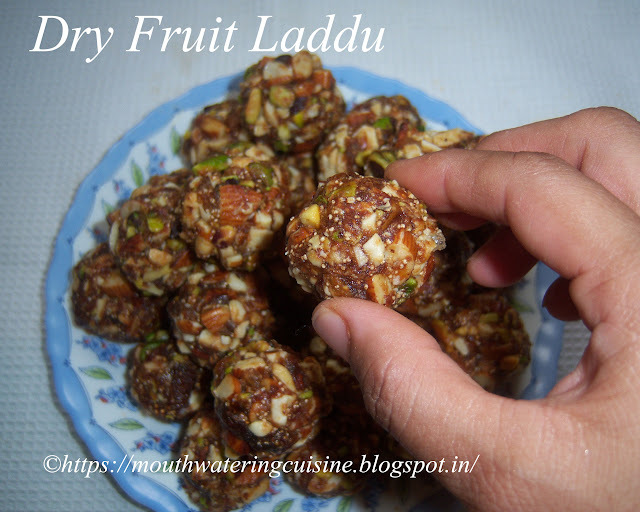 Serve dry fruit laddus any time. These can be stored n an airtight container for one week. For more sweet and snacks click here.Thank you for visiting my blog. Hope you liked all my recipes. Any feedback and comments are appreciated. dry fruit is indeed a great thing. thanks for sharing this.